Dr. Animesh Agarwal is a renowned Dentist in G T B Nagar, Delhi. Doctor has helped numerous patients in his/her 9 years of experience as a Dentist. Doctor is a MDS - Orthodontics & Dentofacial Orthopaedics, BDS. 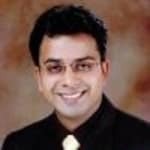 You can meet Dr. Animesh Agarwal personally at Delhi Dental Cosmetics in G T B Nagar, Delhi. Don?t wait in a queue, book an instant appointment online with Dr. Animesh Agarwal on Lybrate.com. How can I get rid from my yellowish teeth. How can I prevent teeth discoloration. Hi lybrate-user issue teeth are yellow because of not taking care of your teeth then you must go to the periodontist and clean your teeth otherwise if your teeth are yellow by birth then you can go for bleaching and the other technique can be the laminates. I have a little gap in my upper front teeth ,also upper front 4 teeth are lightly front ,shall I get tooth binding or go for braces? How much it costs for tooth binding in india. Pls help. Hello ,as per your condition ,it will be best to go for braces. It vl push the teeth backword and make your profile dento-skeletal setup will be improved. Consult any orthodontist for the same. Charges depends on clinic and doctor ,roughly it's starts from 20-,40 thousands. I used gutkha. Now my mouth is not opening completely. What should I do at home (without going to hospital)? Please help me. Stop chewing gutka and visit dental surgeon for checkup. For opening of mouth you need to do mouth opening exercises. Use colgate total paste and listerin mouthwash twice a day. Do rinse your mouth with listerine mouth wash. I had a bad habit of chewing gutkha now gracefully I have quit it but my teeth has red & black, marks how should I remove it? I am having severe pain in my left lower JAW. Very difficult to open the mouth/move the jaw. But no pain in ear or tooth. I have taken antibiotics Moxikind 625 for 5 days (1-0-1) with IMOL. Pain was reduced onlywhen the tabletefect was there. Since last 2 days I ham having little pain when outer portion of the ear is pressed. Jaw pain is still existing what should I do? Get your jaw examined by a dental surgeon for the reason of this pain, he will examine and do the needful. The treatment you taken is fine, you can take tab combiflam in case of pain and do mouth opening exercises carefully. Gaps between my front upper teeth. I want permanent crowns fixing treatment .is it possible. I want approximate treatment cost details please. If less than 2 mm spacing then composite buildup - 3000/- per tooth porcelain veneer - 14000/- per tooth if more then 2 mm spacing then braces treatment - 35000 aligner - 70000. I have cavity in last teeth something smell come from mouth Can cavity will be remove. cavity can be treated if there is not too much loss of tooth material..go and ask your local dentist..
Sir, My age is 23 years. I had 2 wisdom tooth discoloration and cavities. Doctors suggested to go for a root canal. I don't want to go for a root canal sir. I wanted to know whether there is any treatment & cure available in ayurvedic without doing root canal. For cavities: Triphala kashaya— gargle once a day KPN paste — twice a day Salt water gargle— once a day. Hi. My left side lower wisdom tooth is paining. But it is deep inside jaw and very close to nerves 90% chances are there that it may damage the nerves while extraction hence my doctor is not recommended surgery. He suggest to remove second molar so that wisdom can grow and once it is far from nerves we can remove it. But after taking second opinion other doctor suggested to go for surgery as it is 50 -50 chances that wisdom will grow. If it stop growing and pain is also there then you have to go for surgery and also loose your tooth unnecessary. Now m confused please suggest. Removing functional second molar to make space for impacted wisdom tooth would be a blunder. Most of the times a person who’s is incapable to remove wisdom tooth would suggest this idiotic plan. Please visit a Maxillofacial Surgeon, Let him assess and tell you the probability of nerve injury. If the tooth is lying so deep fully covered with mucosa then what’s the need for it’s removal. A rough layer has developed on my lips. I am not able to even open my mouth wider. Its dry and has tightened my lips. Its since last 1 week. Please please help me out. I am suffering alot. If your using any food stuff containing arecanut or tobacco kindly quit. Use honey n turmeric to massage the area affected. Hyaluronidase n steroid injections help to heal better. Consult one dentist.